Correct decision making is important. It is more important when it comes to academics and choosing a career. 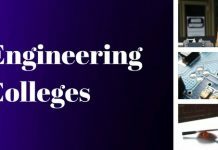 After completing class 12th the decision to choose the best college for engineering is impending upon the students and selecting the best out of the rest is a big task. Choosing an engineering college for graduation is like choosing a house for the next four years. Candidates from Karnataka can take the Karnataka Common Entrance Test (KCET). It is a state-level examination and can be taken by all those candidates who want to seek admission to the B. Tech course offered in Technical colleges/institutions in the state of Karnataka. KCET is conducted every year by Karnataka Examination Authority (KEA). Karnataka is a breeding ground for almost 200 Engineering institutions. These institutes offer engineering programmes like mechanical, electronics and computer science. So, in order to aid candidates who are planning to seek admission in these institutions, we have compiled a list of all the engineering institutes of the state of Karnataka based on the rankings received by National Institute of Ranking Framework (MHRD, Government of India). Aspiring Students can choose any of these colleges as they are ranked based on their faculty, infrastructure and most importantly their placements. However, the candidate has to give entrance examinations like KCET and COMEDK to take admissions in these private and government institutes. Students from both Karnataka and outside it will be able to take admissions to these colleges.